DC Home and Condo Prices: Condo Price Cuts: Through the Floor? During the year I've been tracking condos listed on MLS to identify sales by flippers and determine their anticipated profit; I've used this information in many of my posts. I periodically monitor this data source for pricing actions as the year progresses to see the degree to which prices are falling, if at all. Can you believe a condo's price can be cut by $500,000? 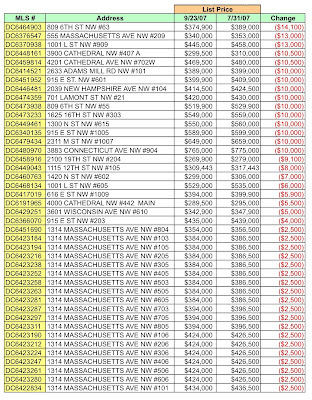 The Grant [1314 Massachusetts] has lowered prices on listed units by $2500. 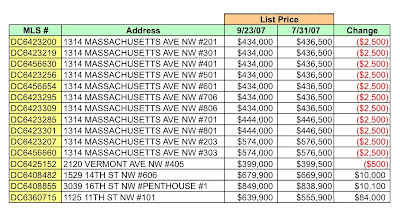 Despite its $44,000 price cut, 915 E St #308 [The Artisan] is still for sale at $29,900 more than it sold for in January 2007. 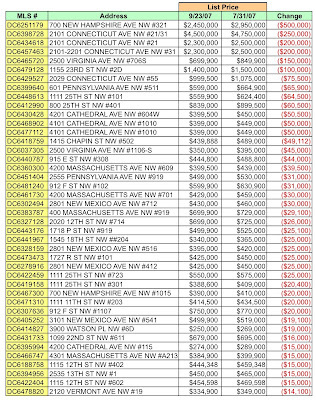 The developer of The Ventana [912 F St NW] has lowered the price of #102 by $31,000. At The Atlas [1111 25th St NW], #101 reduced its price $64,500, #723 by $25,000, and #301 by $20,400. That's a loss for #101 and #723 from their original purchase prices in 2005, #301 might eke out enough to pay the real estate commission and break even on its 2005 purchase price. I think sales like those at the Atlas, units which were bought at the height of the bubble, bear watching. Will such units hold their value or, as the bubble continues to deflate, will values begin to fall below 2005 purchase prices? Looks like you may have uploaded the same image twice. Aren't the first two images identical? Yes, they were. Thanks for pointing it out, it's been fixed. I commend you on the stats...very helpful and thanks.